Summitmist Manor; there were six on the night of last and then there were none... save one. Receive your assignment from Ocheeva. Travel to Skingrad and enter Summitmist Manor. Choose a method and kill everyone in the Manor. (Optional) Convince the remaining guests that you are not the killer. Return to Ocheeva for the reward. The mini-quest to get your next contract from Ocheeva is titled "The Night Mother's Child". You will be directed to Skingrad to meet Fafnir, a Dark Brotherhood assassin posing as a doorman for a house party in Summitmist Manor. He'll provide you a key and some details on the party. Once you enter the manor, you will not be allowed to leave until the contract is fulfilled. Your objective is to kill everyone within Summitmist Manor. In order to get your bonus you must not be observed/suspected by the remaining guests. All of the guests have a tiny amount of health, making them easy kills. When you have finished, return to Ocheeva for your reward of up to 600 gold (level dependent), and if you have achieved it, a bonus of the Night Mother's Blessing: a permanent +2 to your Marksman, Security, Sneak, Acrobatics and Blade skills. While Gogron gro-Bolmog might applaud such brutal efficiency, it's certainly more fun to be creative. An interesting method to achieve your goal is the manipulation of your targets. As some of your Dark Brotherhood companions will tell you before you execute the contract, your (possible) reward from Bad Medicine, The Deceiver's Finery, will come in handy during this contract, as it provides a nice boost to personality and speechcraft. Raise each target's disposition high enough (70 or more) and you'll eventually be able to gain their trust, meaning that they will suspect you the least, if at all. This relationship will prove beneficial in their disposal. Also try lowering the disposition of the guests; they will begin to suspect you as the killer. Depending on their respective aggressiveness, they may even attack you. Note that if the last guest fingers you as the killer, this does not forfeit the bonus. Execute the quest under the parameters of "undetected" and you will still receive the Night Mother's Blessing. Snipe from across the room with your bow. Use Poisoned Apples, which can be purchased from M'raaj-Dar in the Cheydinhal Sanctuary. Only Nels cannot be killed this way. If you don't feel like taking the time to raise their dispositions, an alternative method of getting them to do your dirty work is to use Frenzy and watch them kill each other. If you opt to bribe the guests, you can recover all of your money from their corpses at the conclusion of the quest. If you equip the Gray Cowl of Nocturnal with low personality or fame, the guests may attack you. If you kill them with this method, you won't lose your bonus. Dovesi Dran: Talk to Primo about her. He'll tell you that he rather likes her, and asks you to "put in a good word" for him. Go to her, and if you have raised her disposition, she will confide in you that she is attracted to Primo, also. Tell her that he said for her to wait for him in his room. She will run off excitedly to his room, at which point she will be isolated and a prime target. After one of the guests has died, she will give you the option to say a few things to assuage her fears of being killed, one of which is the familiar [Say Nothing]. If you choose this, she goes down to the basement alone and sits on a stool facing the wall, making herself easy pickings. She dislikes Matilde (accurately accusing her of being racist). If she is the last one you leave alive, she will beg for her life, unless her disposition is raised high (in which case she will try to enlist you to help her escape). She doesn't understand why people call Nels naughty. She thinks he seems nice. With a high disposition she can be turned against the 'second to last' victim, including Primo. Matilde Petit claims to be a Breton aristocrat. She will greet you when you walk in; tell her that you're an assassin to earn a disposition bonus, as she will view your reply as a grand joke, even if you're wearing the Shrouded Armor and have a knife in your hand. Wait a while and she'll offer to work with you to find the treasure. You will be able to send her to the basement, where she will be alone and prime for killing. Matilde doesn't like Dovesi because she's Dunmer, and is disgusted by Nels because he told her "the most off-color joke about an Argonian maid". She is more fond of Neville and Primo. If she and Dovesi are the last two alive and her disposition towards you is high, she'll attempt to kill Dovesi. Nels the Naughty likes to drink. He stands in the same spot all the time, and is an easy target when no other guests are present. He likes Dovesi because she reminds him of his late daughter. He doesn't dislike Primo, but Nels will begin to suspect him earlier on in the quest. He dislikes Neville because the Imperial Legion refused to help him and his fellow villagers when they were attacked by bandits in Solstheim, leading to the death of his daughter Olga. If he and Neville are the last two alive, Nels will likely pick up any nearby weapon and attempt to kill him. Also, if you have raised his disposition high enough, he will attack Matilde if he and she are the last two guests left. If he's the last one alive, he will head for the basement. If Nels and Dovesi are the last two alive, and you have a high disposition with Nels, he will choose to believe that the attacker must be coming in through the window rather than believe that you or Dovesi could be the killers. Dovesi has no such inhibitions about killing Nels however... Nels can also be convinced to kill Primo if they are the last two alive. Nels is the only guest whom, even with maxed disposition, will still recognize you as the murderer if you killed all the other guests yourself. He also appears to be unique in that he fits Primo's description of him, that behind the drunkard he is hard and calculating. He is the only guest who realizes, relatively early, that there is an assassin sent to kill them and not a greedy guest. Neville is the soldier type. He sleeps long and soundly. He hates Nels and sees Primo as bored. If he and Nels are the last two alive, he'll head to his room to retrieve his gear so that he may try to kill Nels (disposition of 70 required to persuade Neville to attack Nels). He pities Matilde and her loss of income, and thinks that Dovesi doesn't like him, which is true. If Neville is the last one left alive and your disposition is high enough when you talk to him, he says that he will find an axe and try to chop down the door. It is during his attempt to break down the door that he is most easily killed. If his disposition is low however and he is the last one alongside you, he will conclude you are the assassin and attack you. Though even equipped in his Imperial Legion armor he is laughably easy to kill, as he has only 1 hitpoint. Him figuring you out as the murderer does not affect your bonus either. Primo Antonius is an Imperial from a wealthy family. He sits around the ground floor most of the time. He doesn't believe that Matilde is really an aristocrat, and is attracted to Dovesi. He views Nels as the tragic drunk and Neville as the typical greedy soldier. If Primo and either Dovesi, Neville, Nels or Matilde are the last two left alive, talk to Primo and he'll attempt to kill the remaining guest (assuming your disposition towards him is high enough). Here is a brief summary of what each guest feels about the others. Dovesi is attracted to Primo, likes Nels, doesn't like Neville, and hates Matilde. Matilde likes Primo and Neville, and dislikes Dovesi and Nels. Nels likes Dovesi, doesn't like or dislike Primo, dislikes Matilde, and hates Neville. Neville likes Dovesi and Matilde, views Primo as bored, and hates Nels. Primo is attracted to Dovesi, and doesn't like or dislike Nels and Neville and hates Matilde. The weather will always be a thunderstorm when you arrive at Summitmist Manor. Fafnir's script is written to force the weather to turn stormy when you approach him. Though Vicente says "For Sithis' sake, don't wear your hood. ", wearing the Shrouded hood makes absolutely no difference to the guests' thoughts and actions. The door to the manor is scripted to keep all of the quest-related NPCs from leaving, but as a result, no other NPCs can leave. The only way to get followers out of the manor is to use fast travel. Due to an event detection bug, you will not be detected if you kill the guests with a melee weapon of any kind, including your fists or weapons with area-of-effect enchantments. Spells and ranged attacks, however, will be noticed normally. 100 Finishes quest I have accepted a contract from Ocheeva. 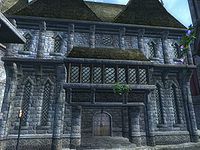 10 I must go to Summitmist Manor in Skingrad, meet with the other guests, and pretend I too have been invited by a mysterious, unknown host. I must then kill all the other guests. I should start my mission by speaking with the doorman, just outside the manor. 15 I have spoken with Fafnir, the doorman, who appears to be a fellow member of the Dark Brotherhood. He has provided me with the key to Summitmist Manor, which I am to use only after all the guests lie dead. I should now proceed inside and meet the other guests. 20 I have arrived at Summitmist Manor. I must now kill the unlucky guests -- Matilde, Dovesi, Primo, Neville and Nels. If I can eliminate each guest secretly, without any witnesses, I will receive my reward and a very valuable reward. If I am discovered, the contract will be complete, but any bonus will be forfeit. 30 All of the guests are dead, and no one knew I was the killer. I must now return to the Sanctuary and speak with Ocheeva to receive my reward and bonus. 35 I have been detected! I must now complete the contract by killing everyone in Summitmist Manor, but my bonus will be forfeit. 40 All of the guests have been killed, but someone discovered I was the assassin. I must now return to the Sanctuary and speak with Ocheeva to finish out the contract. Unfortunately, I will receive no bonus. 50 I have spoken with Ocheeva and received a special reward, the Night Mother's Blessing. I now have permanent increases to my Sneak, Blade, Security, Acrobatics and Marksman skills. 100 Finishes quest I have completed the Summitmist Manor contract. It is possible to use the console to advance through the quest by entering setstage Dark08Whodunit stage, where stage is the number of the stage you wish to complete. It is not possible to un-complete (i.e. go back) quest stages. See SetStage for more information. Esta página foi modificada pela última vez à(s) 14h47min de 3 de agosto de 2015.